Avocado Milkshake, originally uploaded by mysteryship. Since the next few days are going to be divine, I suggest stopping by 8th Avenue for a bubble tea, milkshake, or lemon ice. My favorite places are Ba Xuyen (you can request less sugar in the milkshake if you want), TenRen, and Tbaar. What are some other great places for a cool drink? Oh, and please DO NOT buy ice cream from the guy who idles at the top of the hill by the park. Frequent the ice cream sellers with the carts. They work a lot harder, they are more friendly, and they don't pollute our lungs and ears. Alternatively, stop by Fabio's Coco de Helado on 4th Avenue. The coco is great, but the morir de sonando lives up to its name. where exactly is Fabio's on 4th? I believe it's by 49th Street. On the western side of the street. Hey there! Stumbled upon this site while reading one of your reviews on yelp, hope you don't mind. 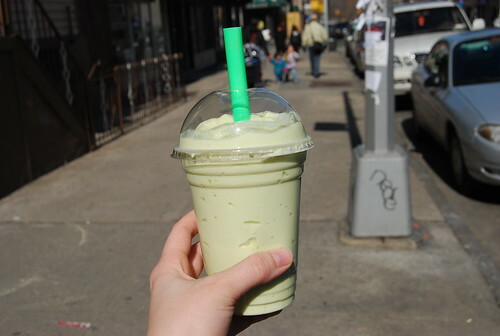 I've been living in 8th ave almost all my life and I've never tried an avocado milkshake before. It looks really great, especially because I do love avocados :). Will take note of this the next time I decide to buy a drink. Hm, you didn't mention Quickly? I usually go there for bubble tea, but I still love TenRen and Tbaar. I've been looking for a nice ice cream store for awhile now. I'll stop by Fabio's someday, thank you! Have you tries the durian shake at Ba Xuyen? I enjoy all the bubble teas, but I am working up the courage to dive into that shake.